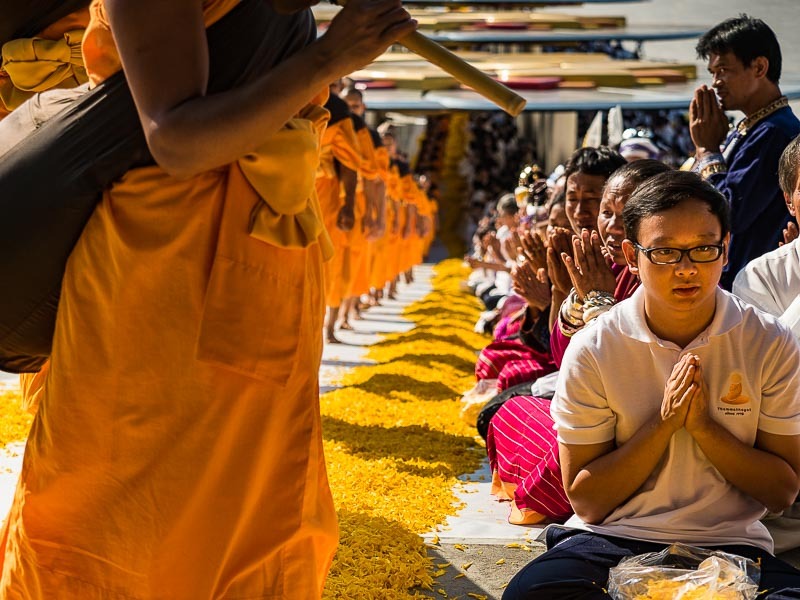 Monks from the Dhammaya movement start their annual pilgrimage through central Thailand from their home temple at Wat Phra Dhammakaya in Pathum Thani province. One of the things I cover almost every year is the pilgrimage of monks from the Dhammakaya movement. This year more than 1,300 monks are participating in the pilgrimage. 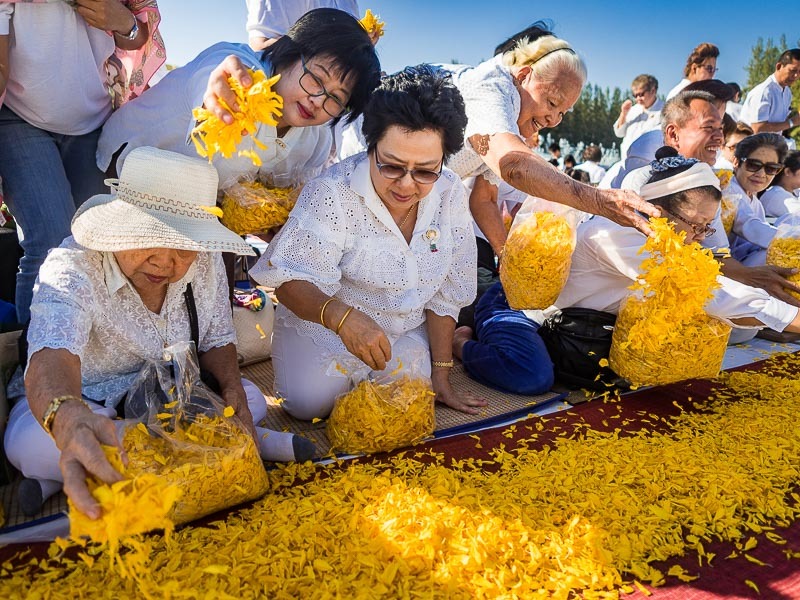 The Dhammakaya movement is controversial. Although they are Theravada Buddhists, like most Thais, the Dhammakaya movement differs from traditional Theravada Buddhism in a couple of ways. Lay people sprinkle marigolds on the path the monks will walk. Theravada Buddhists are open to non Buddhists studying Buddhism and becoming Buddhists and there are quite a few Westerners practicing Buddhism in Thailand. But traditional Theravada Buddhists do not evangelize. Non Buddhists are welcome at temples and monks will gladly talk with you about their faith but they don't overtly try to convert people. Dhammakaya Buddhists, on the other hand, do evangelize. They also practice a sort of Buddhist version of the prosperity gospel, similar to what American evangelicals practice. 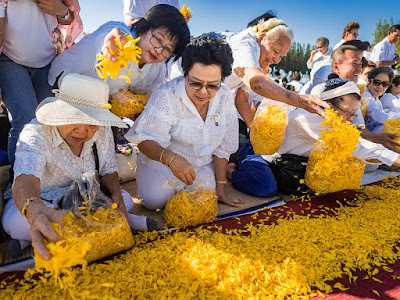 In fact, I think the Dhammakaya Buddhists are to traditional Buddhists what evangelicals are to mainstream Christians in the US. A man prays as the monks walk past him. The Dhammakaya temple in Pathum Thani, about 90 minutes from Bangkok, is quite a site. It does not resemble a traditional Thai temple in any way. Like the mega churches favored by American evangelicals, the Dhammakaya temple is huge - Dhammakaya officials claim it can handle more than 500,000 people at one time. I don't know if that's true but it's about two kilometers (1.2 miles) from the main gate to the main chedi in the center of the temple complex. More than anything, it looks like a giant UFO. Planes coming in to land at DMK usually have a great aerial view of the temple. 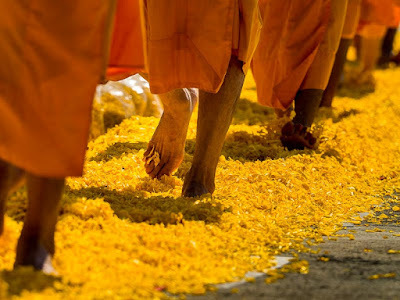 Monks walk on a bed of marigolds laid in their path by the faithful. The pilgrimage has also been controversial. Even in the best of times, traffic in Bangkok is a mess. 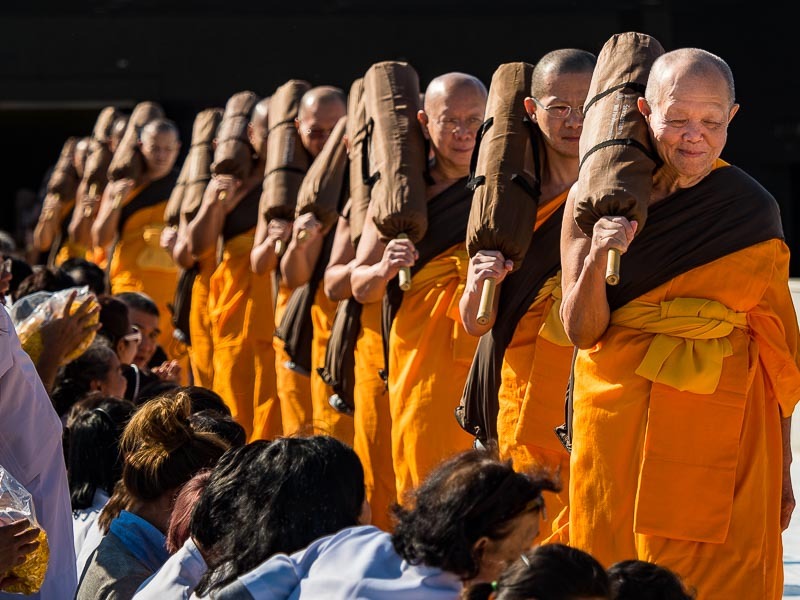 Put more than 1,000 monks on foot in the street with their followers lining the route and it's a formula that's guaranteed to create gridlock. Last year people complained about the traffic problems created by the pilgrimage. This year, the cities the monks are supposed to walk through were more proactive and the government told the temple the monks could not walk the pilgrimage route. Instead, the monks are being bussed from temple to temple and participating in rituals at the temples. But the first day of the pilgrimage, which took place entirely on the sprawling grounds of the temple, went as scheduled. There are more photos from the first day of the pilgrimage in my archive or available from ZUMA Press.